Possums are often desperate to find homes. They can be displaced due to habitat removal, demolition of old buildings, exclusion from house roofs, or through territorial disputes with other possums. Sometimes an opening that appears to be a passage to a lovely new home ends up as a one-way trip down a chimney, flue or exhaust duct. 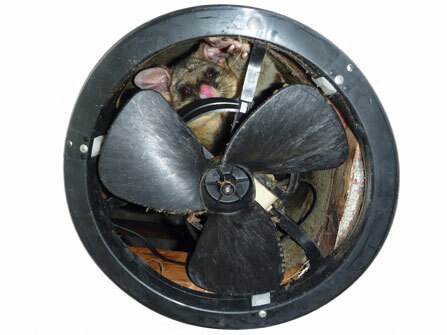 For this poor possum, the exhaust fan had to be dismantled to gain access to the animal.